innovations that have changed the face of skiing bear their signature. Elan’s products are born from a close cooperation between the R&D department and master craftsmen who can bring ideas to life. The process is not always straightforward as certain advanced design concepts pose major challenges and may even seem impossible at first. But Elan is home to some of the greatest masters of their craft. 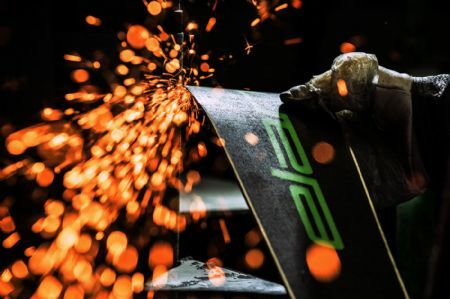 Just about every designer, engineer and craftsman is an accomplished skier in their own right, so they know exactly what to do and which materials to select for a ski to act a certain way. The process of making a ski has many interesting steps. The press is certainly one,but the most visually exciting is certainly the grinding of the edges where the skis sparklike an iron foundry. The hall where the woodis kept smells the best and meticulously assembled sections of the core provide an interesting insight into the inside of a ski. Looking at different core profiles it becomes clear how one ski can be stiff enough to grip the iciest of slopes while another is friendly and soft. The ski molds are an interesting sight as well, and each ski model and length has a dedicated set. They are a sort of archive of all Elan skis. It is interesting to note that Elan makes skis by starting with the top sheet graphics. 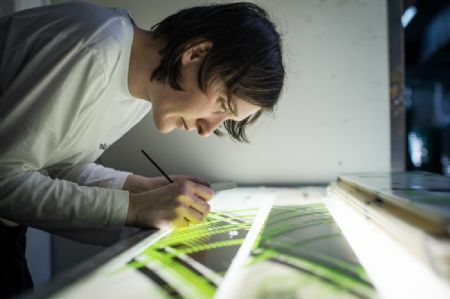 For several years now, they start with silk screening the design, logo and unique ID code onto the transparent top sheet. 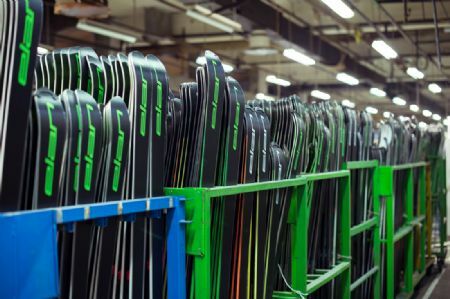 As each ski progresses through the manufacturing process, the unique identification code bears the signatures of all the persons that touchedthe ski during production. The halls of Elan’s factory hold an eternity’s worth of legendary skiing tales.Of course, the most important ones haveto do with the racers that won World Cups, Championships and Olympic Games. Racing always had a special meaning for Elan and the company always knew how to listen to racers' wishes and needs. Sponsored racers receive skis custom tailored to their individual style. If Filip Flisar wishes for a GS racer with improved tail grip, that is exactly what he gets. 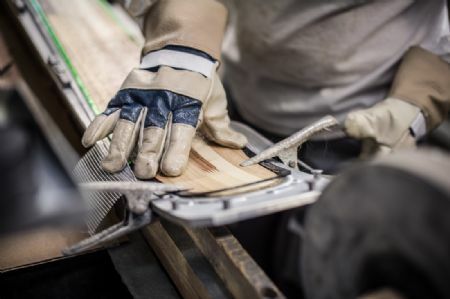 Elan skis are a unique combination of seventy years of tradition and cutting edge technology and innovation. Throughout skiing’s history, Begunje’s R&D department has stayed at the forefront of global trends. It is a known fact that Elan’s innovatorswere the first to come up with a prominent sidecut ski - what we now call a carving ski. After that major shift in ski technology,there came a host of unique technological solutions, including WaveFlex, Fusion, Amphibio, Amphibio 4D, TNT technology, U-Flex and the unbelievably light women’s skis that won awards for their technology and design all around the world. These achievements make Elan more than just a factory or a brand name. Elan is an important co-creator of skiing’s past, present and future, and the factory in Begunje is one of those hallowed places in skiing, spokenof in revered tones by skiers from all over the world. ELAN HAS ALWAYS BEEN KNOWN AS THE ULTIMATE INNOVATOR IN THE WORLD OF SKIING. The company’s work ethic is firmly rooted in technology and design innovation, and its achievements have received many prestigious international awards. In the last decade alone, Elan has received more than 45 prestigious international awards, and was named the most innovative brand in sports twice. We are always flattered when our products get attention from award commitees and loyal users. The new 16/17 ski collection has already received several important affirmations that they are the hot products for the next winter season.